We hope that everyone enjoyed the short Indian Summer that we've been having and have had a chance to pursue their favourite last-minute summer activities. September of 2018 continued the trend of the last few months: July sales hit a 30 year low, August a 6 year low, and September a 10 year low. The last time that we had similar sales numbers in September was in the infamous year of 2008. Keep in mind that there are now more homes overall in the Lower Mainland than in 2008 with the high pace of building and densification over the last few years. We are also noticing a large spike in the number of listings that have been terminated or have expired in the last few weeks. Throughout September, the average number of terminated/expired listings was about 1300 a week. In the first week of October, it has risen to 2098. This may indicate that sellers, much like many buyers, are going to take a wait-and-see attitude. The average terminated listing was removed from the market approximately halfway through the listing period, which was, on average, 148 days long. Here are a few tables to better show what the most recent market statistics are doing. As an example of reading the statistics below: for one bedroom units in Metro Vancouver, 16 of the 50 sales (32%) were at or above the asking price (98.4% of the asking price, on average) and were on the market for an average of 20 days in the last week of September. Red numbers means the number is lower than the previous month. Blue numbers mean that the number is higher than the previous month. Green numbers mean that the number is the same as last month. For all property types, the sales-to-active listings ratio for August 2018 is 16.3% (July was 17.1%, June was 20.3%, and May was 25.1%, so the trend is towards a buyer's market). By property type, the ratio is 9.2% for detached homes (July was 9.9%, June was 11.7, and May was 14.7%), 19.4% for townhomes (July was 20.2%, June was 24.9%, and May was 30.8%), and 26.6% for condominiums (July was 27.3%, June was 33.4%, and May was 41.7%). Just like last few months, August's sales-to-active ratios are all heading the right direction if you are a buyer. 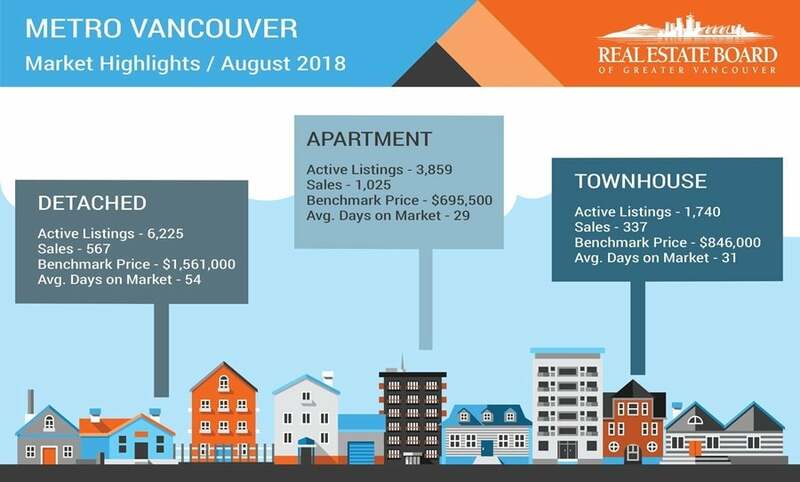 Included below are the latest statistics for real estate in the REBGV (Real Estate Board of Greater Vancouver) and FVREB (Fraser Valley Real Estate Board) areas. You will find a clickable link to each area below which will open up as a separate PDF file. Please feel free to contact us if you would like specific information for your sub-area or if you would like a market evaluation of the value of your home.